This unique product was designed and developed by Dr. Ric Redden as an emergency support aid for various foot ailments. Taping this product to the frog of most feet offers the painful foot a resilient cushion support as well as protection, slight heel elevation and the benefit of slightly reduced breakover. The Lily Pad placed on heavy, full frogs often reduces heel contact with the ground, a very helpful aid for acutely bruised heels and corns. Stall rest is then suggested for a few days, or until the acute inflammation has resolved. Note: This product is not designed with high mechanical advantages concerning deep flexor tension. It is an emergency aid and when used for acute laminitis it is necessary to always assess the degree of damage and utilize higher rating mechanics when indicated. The Lily Pad can be a useful aid for chronic laminitis provided palmar angle is less than 5 degrees. 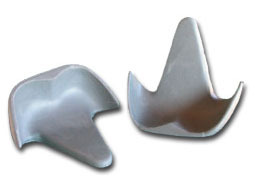 The shape and consistency of the product creates approximately five degree heel raise, extends the base of support approximately 3/4 inch and reduces breakover when placed on flat feet. Those with a deep cup do not experience breakover advantage as the wall remains in contact with the ground surface. The mechanical advantages mentioned above ultimately reduce the forces on the deep flexor tendon as it opposes the laminae and subsequently reduces download of PIII on the inner sole. Mechanical rating is low but can be a significant emergency advantage with acute laminitis until higher rating mechanics can be employed when indicated.